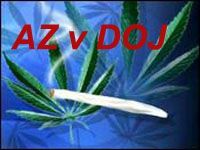 Arizona Governor Jan Brewer filed a federal declaratory action suit today against the Department of Justice, Eric Holder, U.S. Attorney Dennis Burke and some medical marijuana groups, asking the court to rule whether Arizona's medical marijuana law is valid when federal law prohibits it. The complaint is here and the exhibits with the letters from U.S. Attorneys and DOJ memos are here. Did the efforts to boycott Arizona have some impact? The answer is yes. 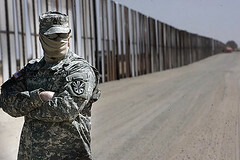 After passing the deplorable SB 1070, yesterday the Arizona Senate defeated five new restrictive immigration bills. Require hospitals to make an effort to determine if the people they are treating are here legally. Restrict the registration of vehicles to only legal residents. Bar admission into state universities and community colleges to anyone who cannot prove citizenship or legal residency. Other provisions in the bills would have required cities to evict all residents of a public housing unit if just one resident is undocumented, required parents to show proof of citizenship or lawful presence when enrolling a child in school, and made it a crime for an undocumented resident to drive in Arizona. 200 U.S. Mayors, gathered at the U.S. Conference of Mayors in Oklahoma today, passed a resolution opposing Arizona's recently passed anti-immigrant law. The resolution was sponsored by Phoenix Mayor Phil Gordon. Arizona shows no sigh of letting up. Republicans there now want to pass a law defying the 14th Amendment and denying birth certificates to children born in Arizona if their parents are undocumented residents. Time Magazine has more here. I wrote last Tuesday that efforts to boycott AriZona Iced Tea were springing up on Twitter, and that they were misguided because the company is based in New York and has nothing to do with Arizona. According to today's New York Times, the mainstream media caught it on Wednesday, the same day AriZona Iced Tea issued a statement attesting to its New York Roots. Last year, AriZona Iced Tea participated in a tea sampling event in Arizona on May 5, to celebrate Cinco de Mayo. Sounds like their principles are in the right place. Good thing for them they had people reading Twitter. Considering they are a privately held company, if this hadn't been caught in the bud, they could have faced some damage. Re-tweets would have spread the word to boycott like wildfire. Bottom Line: Boycott Arizona but not AriZona. The American Civil Liberties Union, the Mexican American Legal Defense and Educational Fund and the National Immigration Law Center, which argue the law is unconstitutional, were expected to outline their legal strategy at the Arizona state capitol in Phoenix. More here. Separately, U.S. Senate Majority Leader Harry Reid will hold a press conference at 5:45 p.m ET outlining the Democrat's immigration law overhaul, which Obama says will be tough to pass this year. Poor Arizona Iced Tea. They are trending on Twitter, with questions about a boycott. But, the company is located in New York. Last year, they were in Arizona on May 5 for Cinco de Mayo related events. It's a privately held company and Chairman Vultaggio still goes to work every day. I wonder if they'll soon be sorry they didn't name the product Santa Ee. 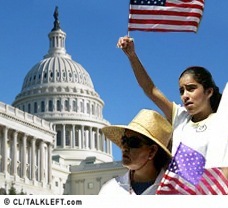 AZ: State immigration law signed; what does an illegal alien look like? The Arizona state immigration bill, S.B. 1070, was signed into law by the Governor yesterday. It permits detention on reasonable suspicion of being an illegal alien, and the burden apparently is on the detainee to prove he or she is a citizen. How does one prove citizenship? Carry your birth certificate? Won't the footprint be a little dated? No picture on a birth certificate. Isn't the burden of proof in a warrantless detention on the government? Doesn't the Fourth Amendment protect illegals the undocumented already inside the U.S.? It has to [in order]to protect the rest of us.